Honda Motorcycle and Scooter India Pvt. 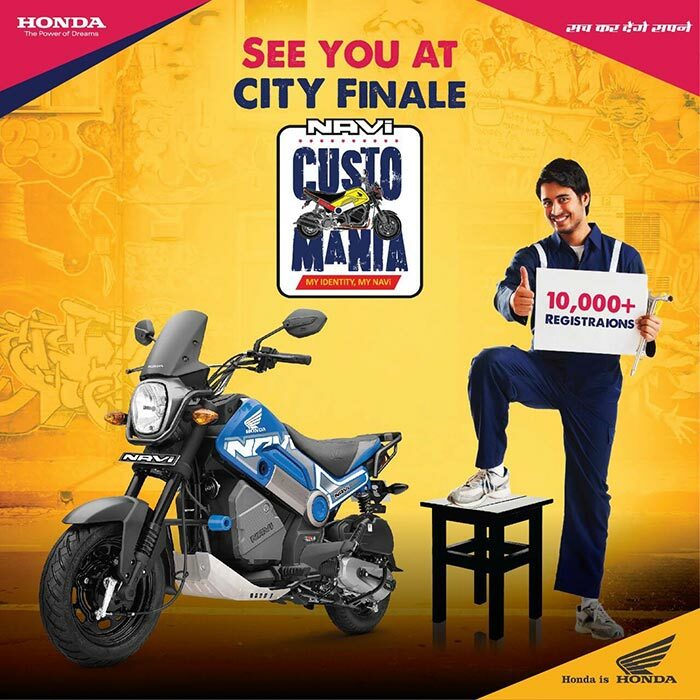 Ltd. today announced the commencement of City Finale Rounds of the 1st edition of #HondaNAViCustomania. The NAVi Youth fest has received an overwhelming response with over 10,000 registrations. Breaking away from the monotony of 100-110cc 2wheeler segment, the NAVi brought with it a fresh breath of life in February 2016. Taking NAVi’s ‘Fun DNA’ a step ahead, #HondaNAViCustomania is making customization mainstream in the Indian 2wheeler industry. The innovation on two wheels combined with the thirst for standing out of the crowd, has transformed #HondaNaviCustomania to a major youth phenomenon. With more than 10,000 enthusiastic registrations, Gen-Y showered its love and signalled that they want their ride to stand out of the crowd. Entering the 3rd Phase, the competition is heating up and will definitely take Indian customization to the next level. Providing a unique platform, NAVi Customania contest has allowed Young India to bring out their mind’s eye to real life on the Honda NAVi. The mix of colours and pure desire for custom building has brought to limelight an unexplored storehouse of talent. Open to both existing customers as well as enthusiasts who do not own a NAVi, the #HondaNaviCustomania gets attractive cash prizes both at the national as well as city levels. Along with the grand prize of Rs 2 lacs, the “Best Customized NAVi” will grace the Honda pavilion at the 2018 Auto Expo. #HondaNAVICustomania began its journey on uncharted waters on October 6, 2017 with the registration phase. The contest then went through a month long construction phase. During this phase, participants were also given educational mentor classroom sessions by YC Design (Mr. Yogi Chhabria) and Autologue Design (Mr. Mukul Nanda). Sharing their years of experience, the mentors guided the participants with in-depth knowledge about customization and brought new zeal in the participants. Moving forward, the City Finales will be conducted in 12 locations across India (Pune, Indore, Goa, Nagpur, Hyderabad, Chennai, Kolkata, Bangalore, Lucknow, Mumbai, Ahmedabad and New Delhi). The winner and 1st runner-up get a chance to fight it out in the Grand Finale in New Delhi on January 28, 2018. A winner each will also be selected from mobile application and website based entries. These 24 entries will also be competing in their respective categories in the grand finale. Along with the winner, visitors in the City Finale rounds will also get to see the full range of customised Navi at the venue. Enthralling the public will be DJs and musicians along with an anti-gravity photo booth. Visitors will also get a chance bring out the artist in them at the activity zone by painting a sketched NAVi.